Aamir Khan misses award functions since the day when he could not win the Filmfare Award for Rangeela. He has mostly skipped film award functions, the last being Academy Awards in 2001 when his film Lagaan was in fray in the Best Foreign Language Film category. After a long haul of 16 years, he has broken the tradition. The Dangal star attended the Master Dinanath Mangeshkar Awards, organised to commemorate veteran playback singer Lata Mangeshkar’s father. Aamir was also conferred with Vishesh Puraskar for his outstanding work in the wrestling biopic. And the person who presented him the award was none other than Rashtriya Swayamsevak Sangh (RSS) chief Mohan Bhagwat. “Today wherever I am, the credit goes to all the writers who have written my films. I am here because of the directors and writer for the wonderful work they’ve done. I thank all of them,” he said. 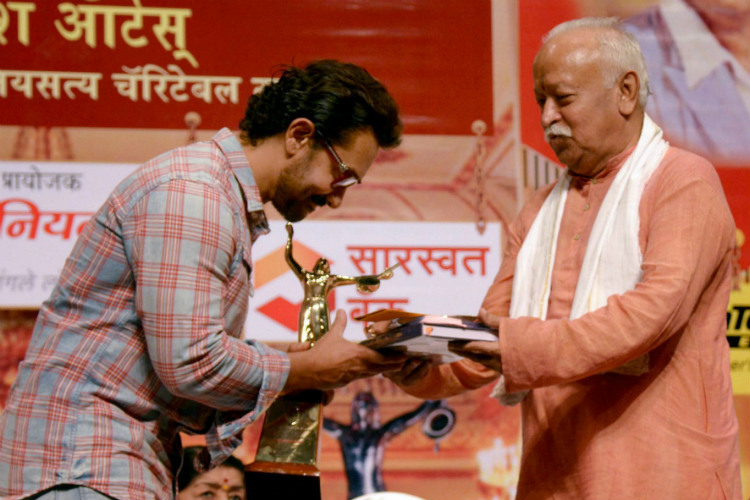 Aamir shared the stage with both Lata Mangeshkar and Mohan Bhagwat at the award function. The 52-year-old actor had sparked controversy two years ago when he had expressed his voice on rising intolerance, claiming his wife Kiran Rao suggested that they move out of India. Soon, the actor was trolled by right-wing groups and dubbed anti-national. Later, Aamir said that he did not call India as ‘intolerant’ but said there were some people who were spreading fear who needed to be brought to book. At present, Aamir is busy shooting for Secret Superstar which will release this Diwali. The actor will also share screen space with Amitabh Bachchan for the first time in Thugs of Hindostan.